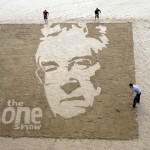 Can you do a sand drawing tomorrow of Randy Newman for the One Show? 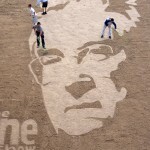 This was the task put to us on Tuesday afternoon by Louise at the One Show. I decided that we could. 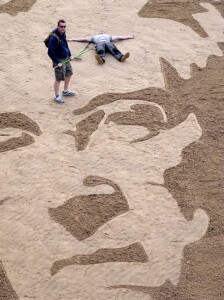 One of the biggest challenges was to find a team that was able to do it at such a short notice, but to their credit Andy Firth, James Haigh and Thomas Bolland wangled their other work commitments to come on board and make this drawing in sunny Blackpool. I decided that we would make a portrait of Randy Newman, an American singer and songwriter who was to be on the One Show the following day, he is very famous from the 70’s but now more well known for writing music scores for animation films such as Toy Story. 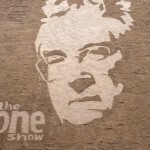 Mark who was the One Show Producer kept asking me over the phone, “So do you really think you will be able to finish it by 7pm?” The poor lad had his doubts, “….and do you really think it will look like Randy Newman?” There was a little strain in his voice as he struggled to comprehend that this was possible. “We’ll make it by seven and I think it will look like him.” I was quietly confident. 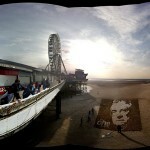 The following morning we rushed to Blackpool to do a reconnaissance of the beach just before the sea came in. We would do our measurements for the drawing whilst the beach was still exposed which would be key later in the day so that we could get straight down onto the beach and begin drawing once the tide went back out to make our 7pm deadline. When you are viewing an image at an angle you have to stretch it in perspective so that it stands up and for this you need to make sure your measurements are correct. For the boffs out there this is called anamorphsis. After two hours of driving we pulled up to the central pier at Blackpool. The tide was already in. Patiently we waited for the tide to subside, waiting for the moment when the sea would reveal some sand and we would fly like rockets. In the meantime the BBC camera crew of five turned up and we settled a few problems. 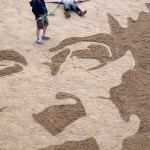 At 3pm the sea began to reveal a section of sand, it was time to make our preparations. Seven o’clock here we come. 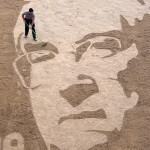 Tom, Andy and I began to draw whilst James raked in the large areas and then finished the lines after we’d drawn them. 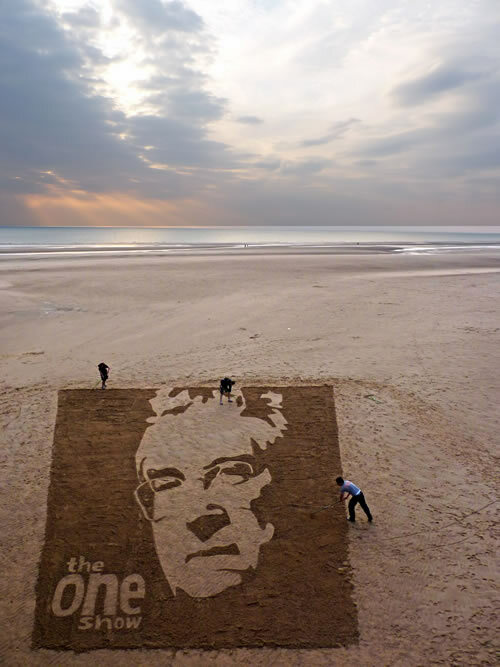 It’s an interesting sensation drawing in the sand, there are all the pressures of the camera crew, the incoming tide and the actual project itself, but drawing in the sand is a sensation of tranquillity as you drift off to the place where it is just you and the lines you draw. I love it. 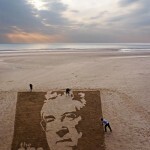 At 4:30 Mark came down onto the beach from the pier where the image was being viewed. His whole demeanour had changed and he was beaming with delight, approaching me with a big grin on his face, “It is looking absolutely amazing!” We were some way from finishing but this was very encouraging as we on the ground had not yet seen the image from above. Thank you very much, I’m glad you enjoyed it, I know I did. Randy phoned up the following day to say thank you which I thought was very nice of him. Hey Hazel, it was indeed a lovely day out at the beach and Randy was a real gent to call up and say thanks the following day. We’re all still enjoying the moment even now!